What is Single Thread Needlepoint Canvas? Single thread canvas is one of two basic types of ground fabric used in needlepoint. The key facts in this section of The Ultimate Guide to Needlepoint Canvas, will answer your questions about which single thread material is best suited for your needlepoint projects. Single thread canvas is by far the easiest canvas for beginners learning to work simple needlepoint stitches. It consists of a series of cotton, linen, flax or hemp single strand vertical and horizontal threads woven evenly together and coated with sizing to form a firm ground fabric used for stitching. The intersections of these single threads make it easier to see where to place traditional diagonal stitches, making it less likely for beginners to get confused about whether to stitch over a single thread or a pair of threads as in double-thread canvas. The two most common choices for single thread canvas are mono and interlock. Both come in a variety of mesh sizes as well as assorted colors. Beginners learning to needlepoint usually work their first project on #10 Mono Canvas. With this size single thread canvas, you can easily get comfortable making basic needlepoint stitches, as well as adding a few decorative details as you become more experienced (see above image). Easy On The Eyes - The single thread of mono canvas makes it easy to see the mesh intersections. Sizes #10 to #13 are preferred by many painted canvas needlepoint artists and kit designers as charted patterns can be counted without too much difficulty, and a needlepoint project can be finished in a reasonable amount of time. Exquisite Details Can Be Achieved - As needlepoint expertise increases, skilled stitchers gradually move from #10 to even finer #18-mesh single thread Mono canvas. The finer canvas allows needlepointers of average to advanced skill to stitch detailed motifs and experiment with blending and shading. Most needlepoint shops have on hand blank canvas in #10, #13, and #18 mesh sizes, as well as a wide assortment of painted canvases in these sizes. Congress Cloth is in a category all by itself; but is actually ultra-fine mono canvas! Advanced stitchers who love the challenge of working needlepoint projects with lots of tiny details will often use #24 Congress Cloth, a single thread mono canvas that is so fine, it looks like soft cotton fabric. Most of the time you have to purchase Congress Cloth online, as there is not much demand for it to make it cost-effective for a local needlepoint shop to carry. Needlepoint projects that use Congress Cloth are stitched with a charted design. Why? Because the mesh threads are so dense that it’s hard to paint tiny details on canvas without making many mistakes. Congress Cloth comes in a variety of colors including plain white, blue, black, as well as a combination of white woven with silver or gold metallic threads. Projects requiring Congress Cloth are usually offered as special needlepoint classes, either at a shop or a regional or national guild event. You absolutely MUST use a frame or stretcher bars when stitching a project on Congress Cloth. Although it looks like embroidery fabric, DO NOT USE a hoop as this will pull the mesh threads out of shape and distort the needlepoint design. Like Mono canvas, Interlock Needlepoint Canvas is also single thread; but instead of vertical and horizontal threads running over and under each other, they are twisted and locked together at the intersections. Take a close look at the above image, and you will see the truth of this statement. Under magnification, the threads look as if they are twisted as well as wrapped around each other. This makes Interlock Canvas a bit stiffer than Mono Canvas. Interlock Canvas does not fray as easily or distort during stitching—even with tight stitching tension. You don’t need to use a frame for stitching with Interlock Canvas as it is stiff enough to hold in your hands when working Continental or Basketweave tent needlepoint stitches. 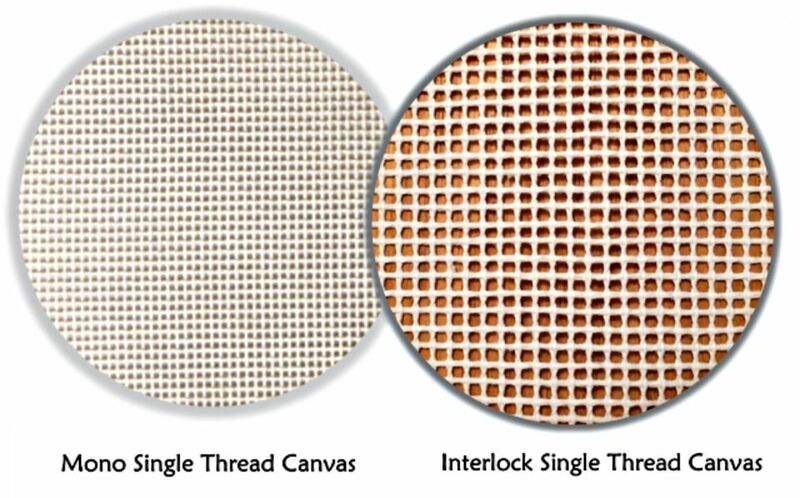 Interlock Canvas works best for straight stitches as well as stitches that cross more than 4 canvas threads when worked. That’s why it is the preferred canvas for the Long Stitch or Bargello needlepoint projects.